Naftali Bennett and Yair Lapid have reportedly agreed to give up the title of Vice Prime Minister, paving the way for a new government. 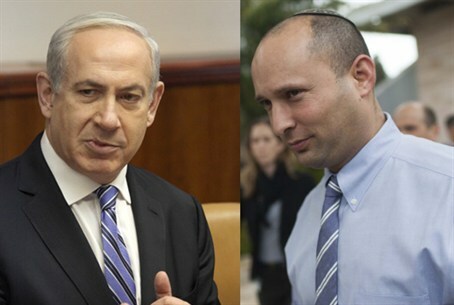 Prime Minister Binyamin Netanyahu spoke on the phone Thursday night with Bayit Yehudi chairman Naftali Bennett and Yesh Atid chairman Yair Lapid, and convinced them to drop their demand to be appointed Vice Prime Minister in the next government, Kol Yisrael radio reported. The two leaders' agreement to give up on this title means the coalition negotiations are complete and the agreements between the Likud/Yisrael Beytenu, Bayit Yehudi and Yesh Atid will be signed on Friday afternoon. The coalition negotiation teams of the Bayit Yehudi and Likud/Yisrael Beytenu gathered for an overnight meeting on Thursday night, in an attempt to finally work out outstanding issues and sign the coalition agreement that will form a new government. The Bayit Yehudi had indicated that the sides will discuss any remaining issues until an agreement is reached, adding that it is believed a final agreement will be reached by the morning. The members of the Bayit Yehudi will convene on Sunday to approve the coalition agreement, the party said, allowing the new government to be sworn in Monday. On Wednesday evening it appeared that all was ready and that the coalition was in place, but another deadlock on Thursday prevented an agreement from being reached. In the latest deadlock, Bayit Yehudi negotiators failed to show up for the final negotiation session with Likud, because the Likud had reneged on a previous agreement to give Bayit Yehudi Chairman Naftali Bennett and Yesh Atid's Yair Lapid the titles of Vice Prime Minister. Israeli news outlets then quoted sources within Likud as saying that the decision to renege on the promise was made because the Prime Minister's wife, Sarah Netanyahu, who holds no official government position, does not want Bennett to be Vice Prime Minister. The chairman of the Likud/Yisrael Beytenu's negotiating team in the coalition talks, Attorney David Shimron, denied that Mrs. Netanyahu was responsible for the last-minute crisis in the coalition talks, saying, “This is simply an ugly spin, it never happened. Mrs. Netanyahu has nothing to do with this matter." An earlier deadlock over the formation of the government was broken on Wednesday evening, after the Likud conceded the Education Ministry to Yesh Atid. Earlier in the day, Netanyahu warned Lapid that time has run out, and that if Lapid could not find a way to compromise on his “excessive demands,” then Netanyahu would approach the hareidi-religious parties instead to negotiate their entry into the coalition. Several hours later, Netanyahu himself caved and agreed to give the Education Ministry to Yesh Atid’s Rabbi Shai Piron. The opposition parties, meanwhile, predicted that the new government would not last long. MKs of the hareidi United Torah Judaism called the new government “disloyal,” “corrupt,” “hateful,” “evil,” and more.